Sometimes little conversations can change the way we see the world in little ways. I tend to be a bit chatty when I'm walking around the hospital and drum up conversation where I can. 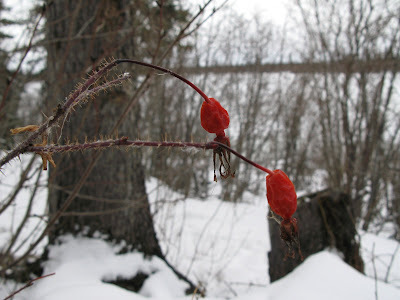 I admit I'd rather talk with an Elder about what it was like to grow up living on the land than talk about a sore throat. Sure, maybe it's thinly veiled work avoidance on my part, but I think it's where I often learn meaningful things about other cultures (and surely, that's useful for talking about future sore throats, with future patients....or so I tell myself). The other day I saw someone quietly sitting at one of the hospital windows watching the world go by with a great big smile. "Nice day, eh?" I said. He turned and gave me the biggest smile I had all day and said "It's the first time I ever saw trees! 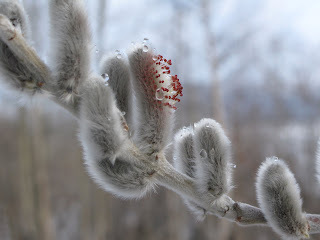 ", and turned back to his watching of the budding trees swaying in the light breeze. No moral, no lesson, but it had me smiling for the rest of the day. 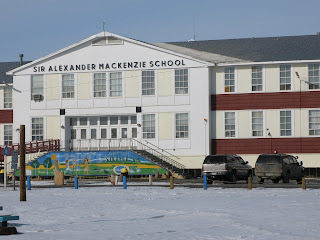 This past week I had the opportunity to visit one of the smaller communities in the MacKenzie Delta called Aklavik. 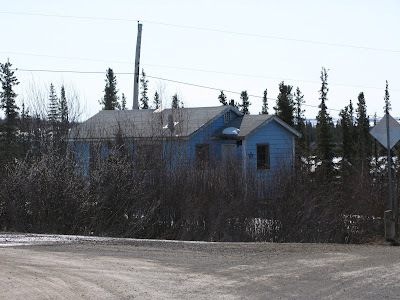 Aklavik is a small hamlet of about 630 people, with a very interesting history. It's location in the delta historically made it a natural spot for trading and commerce. 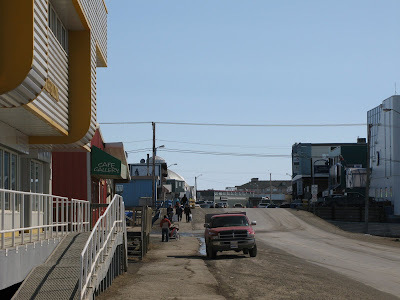 In 1959 the government determined that a new centre for commerce in the Western Arctic was required, as Aklavik was prone to frequent spring floods, and had little room for expansion. 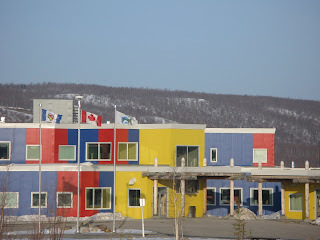 The result was the the building of Inuvik. 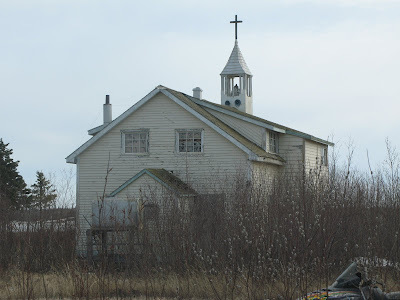 At one point Aklavik had it's own hospital and a large Anglican Cathedral called All Saints, both pictured above. This Cathedral burned down in the early 1970's and was replaced with a much smaller structure, as by that point the community was no longer a major centre. The hospital has long been replaced by a nursing station. 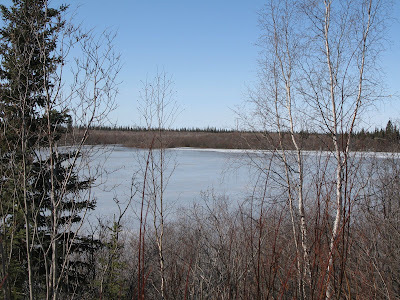 Aklavik is also home to part of the legend of the Mad Trapper of Rat River (also known as Albert Johnson. The story is interesting and worth reading. Basically the Mad Trapper was the subject of an extensive manhunt, lead by the RCMP in the early 1930's. 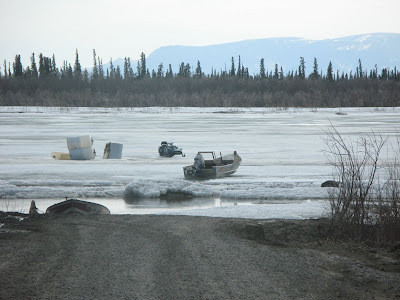 The search roamed over large portions of the western arctic and ended with a gunfight in which The Trapper was killed, and he was buried in an unmarked grave in Aklavik. 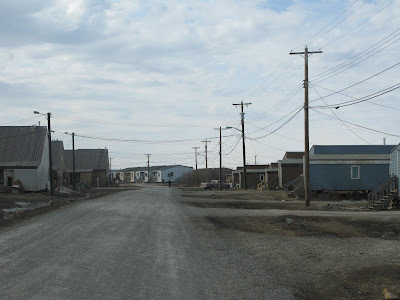 My visit to Aklavik was far less exciting, but still very enjoyable. I got to meet a number of elders and learn about there experiences groing up on the land, and the fascinating transition they have made to their current lifestyle. Oh, and I managed to do a bit of medicine while I was there too. Community visits are always enjoyable, and I always manage to learn something new. Below are a few pictures from the trip. Small planes are still the backbone of northern travel. The melting river, with the Richardson Mountains in the background. 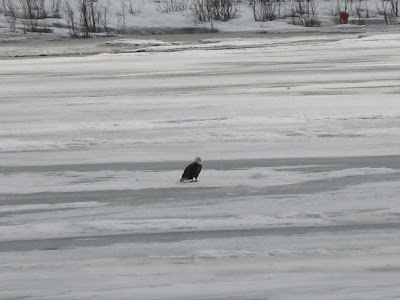 An eagle on the ice (I'm more sure on this bird ID, but correct me if I'm wrong). 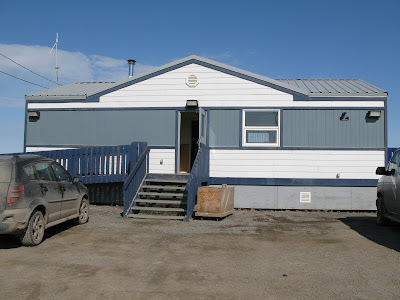 The Aklavik airport (now departing from gate 57, terminal 3....). The MacKenzie Delta from the air. It's amazing that anyone can find their way among the tristing streams and lakes. 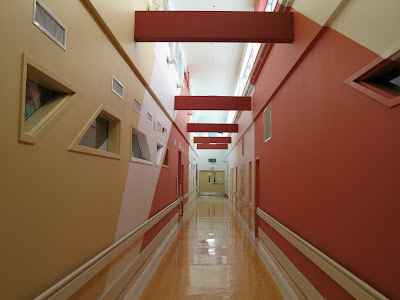 Here's the brightly sunlit hallway to emerg. as I left the building around midnight yesterday. Some sort of berry....I like these macro shots. A little house on a side street. The hospital is perched above this lake. 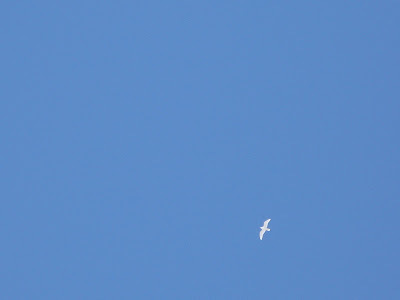 That white blob is a snow goose I believe. 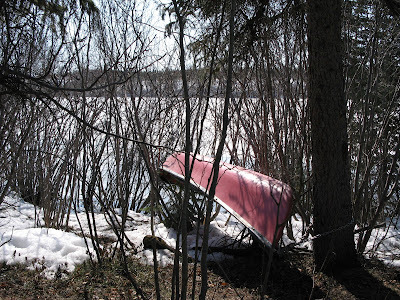 Ahhh, a canoe hidden in the woods. Could anything be more Canadian! This pretty little bridge is on a path along the lake. 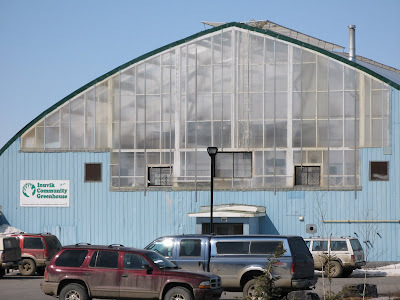 This is the Inuvik Community Greenhouse. It's a co-op project that turned an old arena into a greenhouse. Now residents have a place to grow their own fresh produce in the summer months. 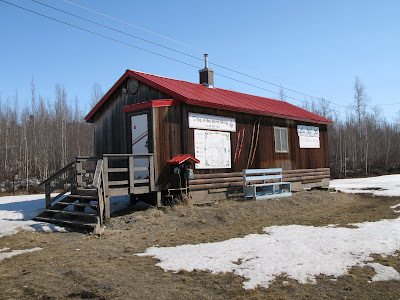 The Inuvik cross country ski club. I captured this shot of the sun at the horizon walking back into the hospital around 3AM. Bud break on a hillside of trees. A patient stumbles through the doorway of the emergency room. Her gaunt appearance and look of fear draw your eyes towards her. She's thin and appears to be barely keeping her balance. She's dressed poorly for the weather. Fearing she might collapse a nurse quickly guides her to a stretcher. Her vitals are HR 170, BP 90/50, RR 38, T 36.7C, O2 100%. She seems confused, and somewhat agitated and cannot give you a history. She doesn't appear to have any injuries on physical exam. As you turn to the desk to order further investigations she asks you for a drink of water. Medicine can be a detective game. Histories, physical examinations, labs and imaging are the clues we use to put together a story and a diagnosis. Sure many cases are straight-forward but the tricky ones can also be the most gratifying. A good night, and a tough case, can leave you feeling like chief CSI of the Emergency Department, and a bad night can leave you feeling like Barney Fife. There is a certain gratification in putting it all together (like House MD, minus all of the unethical and illegal behaviour). Much of this detective work hedges on the assumption of an anatomic, or physiologic basis for disease. Modern medical training highlights the biological basis of disease; an abnormal urine dip here, an lousy blood gas there, and the case is beginning to add up. But what about when it doesn't add up? What about the times when the patients symptoms don't match the biology of the situation? What do doctors do where medicine and morals meet? The idea that disease is caused by faulty personal morality is not new. Madness caused by spirits, or demons has been described since written history began. How such creatures gained access to an individual depends on the society in which the events took place. Perhaps it was a misdeed, perhaps it was karma, perhaps it was simply a sneeze (bless you) that let the demon in, and the madness begin. Often the root of the disease was slightly more complex. Often the real cause was a lapse in personal morality. Not surprisingly many early treatments for diseases involve the release of these 'bad morals' through act or ritual. Trephanation, pictured on the right, was used to release from the head not only medical problems (blood clots), but also moral problems (bad spirits). We of the medical ilk like to believe such superstitious thinking is a thing of the past. Medicine has scienced itself up over the past few decades and our thinking about disease and causality of disease has changed along the way. In the past medicine included any number of diseases caused by 'weakness of mind', 'weakness of spirit' or other equally morally loaded terms. Madness, anemia (chlorosis), schizophrenia, depression, anxiety; all of these diseases have historically been in part attributed to moral causes. It's interesting to consider how the above mentioned diseases migrated from the realm of morality into the realm of biology, and what that has meant for them in terms of their medical treatment. For the diseases mentioned above, improved understanding of underlying pathophysiology, and improved pharmacologic interventions has drastically changed the way they are approached and treated in modern medicine. I've previously argued that moral thinking has a far greater strangle-hold on modern scientific medicine than we think it does. Certain diseases (or conditions) continue to be judged more in terms of morality than biology, and as a result are often not treated at all in the context of modern medicine. Two examples are addiction and obesity. Although both commonly present with a particular set of symptoms, and both are frequently life threatening, they are often untreated because they are the fault of the patient. This is in spite of the fact that for both of these conditions there are interventions (both pharmacological, and non-pharmacological) that have been shown to be effective in rigorous and well conducted trials (the bastion of modern scientific medicine). These days no good addictions medicine presentation is complete without a PET scan showing the biologic basis of addiction. Although well intentioned it is unclear (to me) if these scans exist in order to better direct treatment, or just to justify it. Although the pathophysiology of addiction is on it's way to being as well understood as depression, for many doctors it remains a disease of fault (and therefore a disease untreated). I am not arguing for ignorance of the behaviours associated with these diseases. Far from it, I am arguing for effective intervention into these very behaviours. One of the difficult questions we must ask ourselves in medicine is 'is fault relevant?'. Does it matter that someone with addiction, at some point, choose to use drugs? Does it matter that a diabetic continues to consume 2L of pop (that's soda for you Americans) a day? Does it matter if a patient with lung cancer smoked for 50 years? Does morality (in the guise of causality and hence fault) have a place in medicine? The case I started this article with could easily be a case of diabetic ketoacidosis, or it could just as easily be a case of cocaine overdose. The real question is (aside from obvious differences in medical treatment); why does it matter? Since it was a long weekend, I decided to try something new and make myself some scrub hats. I am tired of the flimsy, disposable blue bouffants at work, and the strange propensity for nasty hair tangles to form beneath them. Plus, what can make a child more at ease before surgery than seeing his anesthesiologist in a colourful and fun scrub hat? Look, dancing monkeys! Enjoy your myringotomy tube insertions! I definitely have to credit Michelle from the Underwear drawer for her instructions. I free-handed the pattern shown on her webpage to help cut out my material. I also had experiment with the sewing machine seeing as how I hadn't really used it before. This sewing machine was my mother's and is apparently 37 years old. Still works like a dream. Note: on careful inspection, you may observe a copy of Smith's Anesthesia for Infants and Children, unopened and abandoned on the table. Making scrub caps counts as studying, no? I am most proud of the rainbow one, which has red piping sewn on using double folded bias tape. Interestingly, the blue scrub cap has a picture of a cat about to dig into a bottle of "fever candies". I find this a bit questionable. Sure I want children to take their pre-op acetaminophen, but do I want them to think it's a tasty treat? There's also a depiction of a cat and dog shooting through the sky on a syringe. It's possible that while designing the pattern, the creator of this fabric was taking some "fever candies" of his own. Over the past few months a number of well written and widely read medical blogs have closed up shop. Barbados Butterfly, Dr. Flea, and Fat Doctor were all favorite reads of mine and I was sorry to see them go. Although each left for a slightly different reason, their departure highlights (I think) some special issues around medical blogging. Blogging itself is an interesting idea. Part reporting, part opinion and part diary, bloggers post online for anyone to read. I admit when I started this blog I thought my family and friends would be the main readers with maybe another northern-type doctor stumbling acroos the page from time to time. I've been amazed that people from all over the world seem to be interested in reading what I write. I wonder if the suprising popularity and penetrance of the above, discontinued, blogs is part of the reason for their demise. Unlike many medical blogs, this blog is not anonymous. There is a real life picture of both of the contributing authors in the top right hand corner, and anyone who is internet savy can likely obtain at least a real world name and mailing address for us. There are a couple of reasons this is not an anonymous blog, but the formost is that I felt the blog was far too specialized to attain true anonymity. 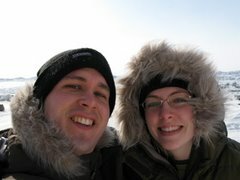 Although I could have posted anon., anyone interested could have figured out a very short list of doctor couples travelling between Vancouver and the arctic. I also wanted to post actual, experiential content (including pics) and much of this by it's very nature precludes anonymity. Patient confidentiality must always be formost in the minds of physicians. It is of course possible that patients, their families, or other hospital staff can stumble into a medical blog, and might recognize sensitive and confidential information, were it to be posted. With this in mind any patient information in this blog is not just anonymized, but fictionalized. Patient confidentiality simply precludes the discussion of specific real life cases in a public forum. It does not, however, prevent discussion of fictionalized cases, based on long term experience, but not on any actual patient, and containing no details attributible to an actual patient. Since I've been up north I've seen a number of fascinating once in a life-time kinds of cases, but I've not commented on any because as with this blog, I believe them to be too unique to be anonymous in any meaningful way. As I've watched some of my favorite blogs disappear, it's made me glad this blog isn't anonymous. I've always tried to steer my posts towards that which I wouldn't mind a stranger, my boss, my collegues, or my patients overhear me say. It will be interesting to see in which direction medical blogging moves over the near future. Will it become a liability that our insurers recommend against? Will it continue to be a window into the triumphs and tragedies of medicine? Will it remain an outlet for those doing their best in systems that seem designed to bring out their worst? Or will it simply fade away...only time will tell. The 5 reasons I blog meme has inspired me to start working on a series of posts about addiction. Since I started practice addiction has been an area of medicine I've been very involved in, and I realise I've posted little on the subject. I hope to post the first post in this series later this week. Finally, for those who are worried about the saftey of my camera with the recent lack of pictorial posts, rest assured, it is safe. 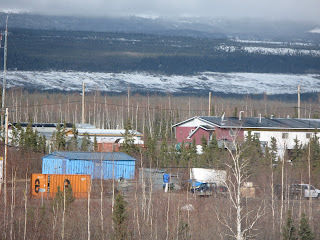 I've recently had some major internet issues here in Inuvik, and have had a great deal of difficulty posting pics. It seems the internet is again working well, and I will continue my endless slideshow in the near future. Today, despite the fact that I was post-call and could have taken the day off, I decided to go to work and help with sedations for the MRI suite. It was a interesting and frustrating day, and it left an impression on me (witness the fact that I am posting on here - a rare event! I can guarantee it won't be as interesting or well thought-out as what Aaron has to say, but I have the password to this blog and I'm gonna use it). One thing you get accustomed to very rapidly as an anesthesia resident is learning to interact with a group of nurses/doctors/techs who have never met you or worked with you before, and therefore tend to view you with a)curiosity b)suspicion c)indifference d)a combination of a,b and c. To make things worse, more often than not the group you are working with is close-knit, has a routine, and the members of said group have worked with each other for say, oh, TEN YEARS, before you interject your little self so innocently and unknowingly. This is hard. It gets easier the more you do it, but it's still hard. It's like climbing a hill every day, and just when you get to the top, you somehow end up starting over at the bottom of an ever-so-slightly different hill the next day. That being said, I thought the people working in the MRI suite were very nice and patient with me. 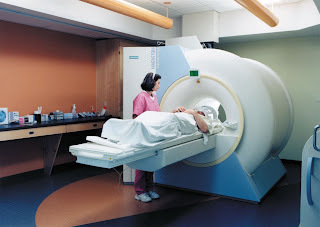 Cause the thing is, the MRI is a big magnet. I know that. You know that. We learned that in medical school, on tv, or in a magazine. But knowning that in your mind, and the reality of standing next to an extremely powerful magnet while trying to sedate small children are two very different things. a unit of magnetic field strength that is approximately the strength of the earth's magnetic field at its surface (the earth's field is about 0.5 to 1G). The value of 1 gauss is defined as 1 line of flux per cm2. As larger magnetic fields have become commonplace, the unit gauss (G) has been largely replaced by the more practical unit tesla (T), where 1 T = 10,000 G.
Um, yeah, I totally knew that. So after all that, I was ready to go. We poked some children with some needles (sorry! ), pumped in some Propofol and off we went to the scanner. This is where something seemed to go awry for me at various points throughout the day. For one thing, it's quite dark in the MRI suite. It was hard to read the infusion pump and connect all the monitors in the semi-darkness. For another thing, I kept thinking I was going crazy whenever I'd get too close to the magnet and suddenly, my name badge was floating, or my watch was being lifted off my wrist. I almost carried a vial of Propofol into the room before an astute nurse asked me what I had in my hand and did it maybe have a metal top? Oops. That would have made a sweet little projectile...and could have seriously hurt someone. At one point I leaned over my little patient to adjust his nasal prongs and everything flew out of my pocket: several syringes, my nametag (yet again) and my pen, which landed (thankfully) stuck to the side of the MRI tunnel, and well away from from anyone's face. This, combined with a few difficult IV starts, a fair amount of crying (not by me), and a reduced amount of sleep, made me at times wish that I was somewhere else. And that I was someone else. I got through the day with the help of some coffee, the kindness of the staff in the MRI suite, the patience of the anesthesiologist I was working with, and a cinnamon bun. And tomorrow I get to do it all over again...in a different room, with a different staff, and a different set of nurses. And no magnet (thank god). In the comments section of my last post Liana, from Med Valley High (an excellent blog! ), tagged me and asked me to post the 5 reasons I blog. There are various reasons I started this blog, and other reasons I keep posting; I've given it some thought and come up with the 5 best reasons I can think of. A General Surgeon I know once told me: "When I'm looking at residency candidates I look for someone with, at most, one interest. General Surgeons don't have a lifestyle that's compatible with interests, so I don't want a well rounded person. A well rounded person will be an unhappy general surgeon." 2) I am easily excited by new things. I admit that I am the kind of person who could spend an hour looking at moss on a tree because it is interesting. When my wife and I go for a walk in the park it's like she has a two year old, I stop and look at everything. I started this blog at a transition point in my life and career, moving from inner city medicine to remote medicine. Transition points are always where the action is, and I began this blog partly in response to my excitement about this particular new thing. 3) I believe it is important to question the philosophical basis of modern medical practice. Medicine, and in fact all of science, rests on certain underlying philosophical assumptions. At present one of the main philosophical trends in medicine (and in wider science) is the idea that only that which is objectively (or measurably) true is actually true. Personally I believe that this is a flawed concept, and undermines some fundamental elements of modern western medicine. The questioning of the philosophical underpinnings of thought is an important exercise, and can lead to debate that surely advances understanding. John Cairns, famed British biochemist, asserted in 1988 that objective data he observed in E. coli favoured Lamarkian rather than Darwinian evolution. He published his findings under the heading of selective mutagenesis. Although he was initially scorned by the scientific community for failing to accept the modus operandi of the day, his questioning eventually lead to breakthroughs in understanding the complexity of modern genetics. Medicine is full of yes men and as doctors we are susceptible to the lure of the next, best, thing. In my blog I seek, in part, to question those yes's. It's easy to let the days slip away without really thinking about the events at hand. I hope that by blogging I'll create a record of interesting thoughts and events that I can go back and read in the future, and think about these interesting times. Both inner city medicine and remote medicine are challenging, fun, and rewarding. However, they're rarely mentioned in medical training. I love the work I do, and hope that someday someone reading this blog stops and says 'Hey, I'd like to try that'. Medicine is a cool job, that requires skill, thought and introspection. Too often medical trainees are exposed to unhappy, burned out doctors who poison them against various parts of medicine. I hope my blog reminds people that medicine is also challenging and fun. Those are probably the 5 big reasons I blog. There are of course other factors; I take a lot of pictures and I need to subject you all to my endless slide show. Thanks to Liana for the subject of this post, it's forced some introspection, and also inspired me for some future posts on topics I'd gotten away from. At the extremes of latitude the days and nights obey a different cycle than most of us are used to. During spring the sunless days of winter steadily lengthen until the world remains alight 24 hours a day. 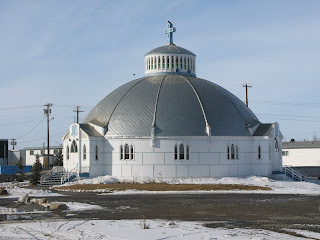 Inuvik is situated well above the arctic circle, and as the solstice nears, the days here are long. There is a time of dusk around 3AM, but even then it the sky remains fairly bright. Since I have been here I've found my usual day night cycle thrown off a little. The light is energizing, and plays havoc with any internal chronometer I might have. I find myself wondering why Conan O'Brien is on TV so early, only to remind myself that it is not really early at all but only a trick of the light. 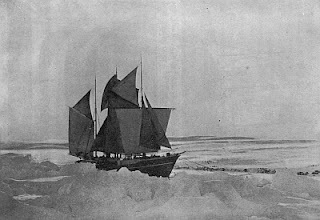 Here's what Robert Peary had to say about the arctic sun as he tried for the pole. It must be remembered that during all this time we were in the region of constant daylight, in the season of the midnight sun. Sometimes the weather was foggy, sometimes cloudy, sometimes sunny; but there was no darkness. The periods of day and night were measured only by our watches—not, during the passage of these channels, by sleeping and waking, for we slept only in those brief intervals when there was nothing else to do. Unresting vigilance was the price we paid for our passage. 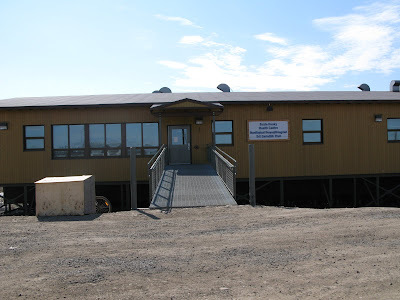 Since arriving in Inuvik I've been working mostly in the emergency department. So far it's been a nice place to work; the hospital is beautiful, the other doctors and nurses are very nice, and there is good back-up available. 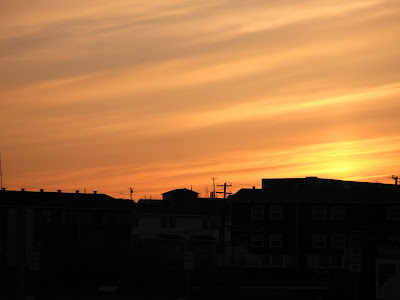 I haven't been out and about in the town too much so far, but thought I'd share a few pictures of my visit to the western arctic so far....(as some of you have probably noticed, I'm a bit obsessed with taking pictures). 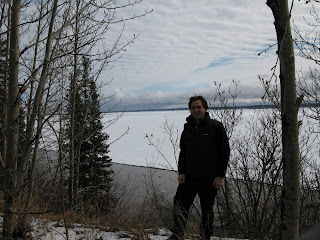 In Norman Wells I took this shot of me on the bank above the mighty Mackenzie River. The end of the winter road means no more easy travel. Norman Wells against the backdrop of mountains. One of the most difficult things about the north is getting there. Canadian weather is not made for fair-weather travellers. I have been lucky so far in getting to Iqaluit and had not been weathered in or out of anywhere (though Dr. H. was weathered into Iqaluit for several extra days when she came to visit). 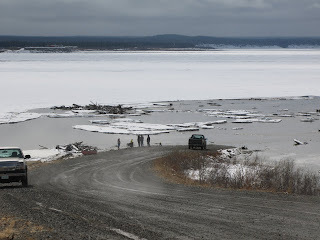 The trip up to Inuvik ended up being a little more challenging. 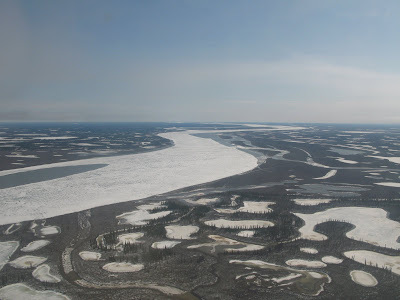 On Friday I began my trip to Inuvik flying from Vancouver to Edmonton. I arrived in Edmonton around midnight, and surprise surprise Edmonton was having a blizzard. Now I have only been to Edmonton a couple of times in my life, but in my very limited experience it seems to be having a blizzard about 66% of the time (or 2 out of the 3 times I have been there). After a safe landing in Edmonton I spent the night in a hotel near the airport and arrived at the airport bright and early to continue the trip northwards. 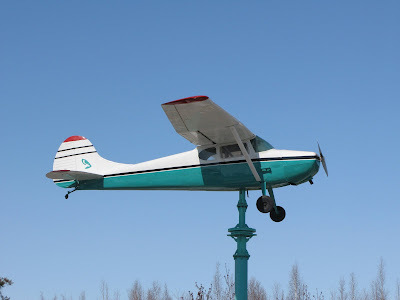 Edmonton to Yellowknife went without a hitch, and from Yellowknife we flew north to Norman Wells. 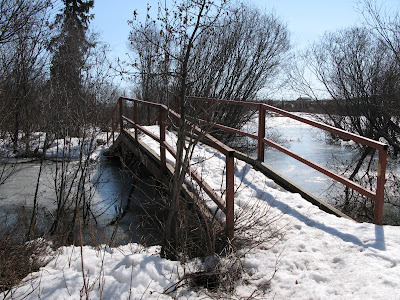 Norman Wells is a small town on the MacKenzie River with a very interesting history. It has fairly extensive oil and gas reserves and during the Second World War the US Army built a pipeline to export the oil for strategic purposes. 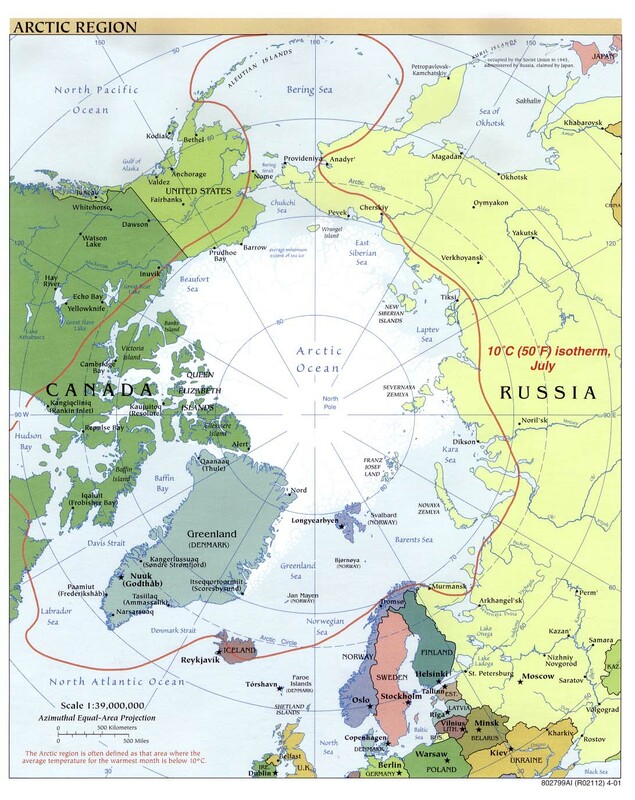 At one point it was quite a centre of activity in the arctic. Today it is a small sleepy town of about 800, although the petrochemical business continues. 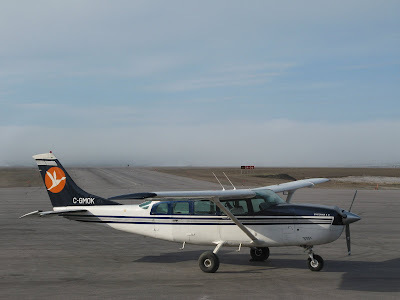 When we landed in Norman Wells it was in a bank of heavy cloud and snow. It was quite an ambitious landing by the pilots and they warned us in advance to expect turbulence and that we would abort the landing if it proved too hazardous. After a successful landing the snow got even thicker and the air crew told us they wouldn't be able to continue on to Inuvik. 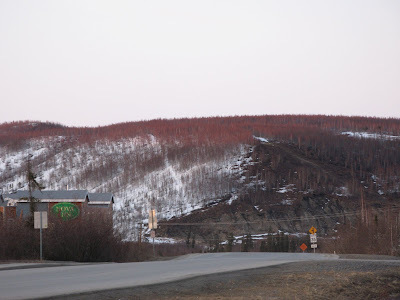 We had the option to stay in Norman Wells, or return to our point of origin to restart the journey the next day. After a long day of travel I opted to be weathered into Norman Wells and checked into a surprisingly nice hotel there (The Heritage Inn). After a couple of hours the weather cleared up and I spent a nice afternoon walking around the town, watching the river as it gets ready to break-up, and checking out the historical vehicles in front of the visitor centre. 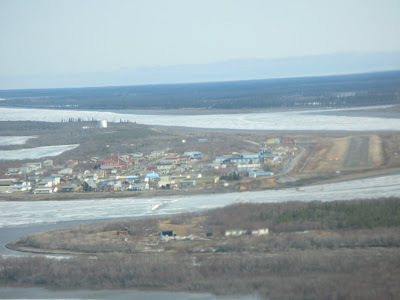 This morning I resumed my trip and landed in Inuvik around noon. Of course I don't believe in getting stressed about the weather, so I thoroughly enjoyed my afternoon, weathered in. In Canada little else is considered as important as playoff hockey. Work slows down, drivers slow down. Radios and TVs are tuned to the game. In a nice resturant somewhere a a man has taken his wife out for dinner. He gets up to use the washroom, and wanders by the kitchen and gets a glimpse of of TV. He's never seen again (well, actually he can be seen nightly sleeping on his couch for the next month). As Canadians we feel we own hockey, and during the playoffs it is all we talk, think and breathe (even the weather takes a back seat). Everyone has their team. Personally I'm a Toronto Maple Leafs fan. As disappointing as they are year after year, I keep on cheering for them, always thinking that next year will be the year. Like many Canadians, once my team is out of contention I cheer on the remaining Canadian teams patriotically hoping that they bring the Stanley Cup home.